OnePlus 6 has been in the news for so long now and is one of the most anticipated smartphones of this year. The company has been teasing the smartphone features for quite a while now, confirming most of the details and features of the smartphone. Last week, OnePlus released a trailer which hints that the smartphone is going to feature the Qualcomm Snapdragon 845 processor. Earlier leaks had revealed that the OnePlus 6 will be featuring an iPhone X like notch at the top of the display. Now, a render of the smartphone has been leaked on Weibo on Sunday. 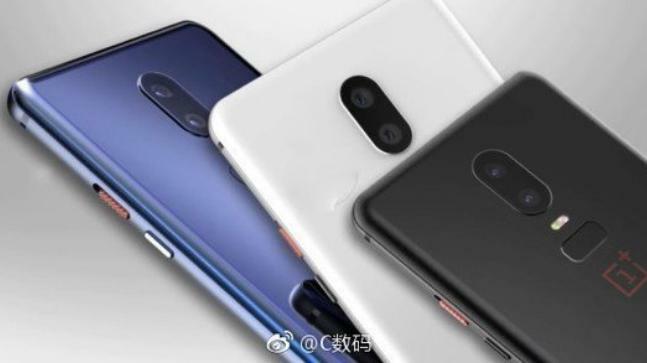 The renders have revealed that the smartphone will come in three color options. These color options are very much different from the company’s previous smartphones like OnePlus 5 and 5T. The color options in the rendered image are Blue, Black and White. The OnePlus 6 in the render images looks like wearing a glossy back with curved edges just like in iPhones. The smartphone has vertical dual camera setup at the rear with dual LED flash below it. The fingerprint sensor is placed at the back of the phone which is not round as in OnePlus 5T. The render also reveals that the alert slider which OnePlus adds in every smartphone has a Red tint over it. It could also be because OnePlus recently revealed that the alert slider will not only control the sound profiles in OnePlus 6, it will also control the focus in the camera app. Summing up the specs for the OnePlus 6, it will feature a display with notch and a dual camera setup at the back. The smartphone will be powered by a Qualcomm Snapdragon 845 processor with at least 8GB of RAM.